Understanding Modifiersuses actual medical records to outline in detail how to document services and apply the correct modifiers. This book was developed as an educational tool for physicians and their staff, as well as billers and coders of hospital outpatient services and ASC services. Optum360 Edge— Educational format. Easy-to-use format for every experience level, for use in the classroom or on the job. Optum360 Edge —Includes all AMA CPT® modifier updates. Optum360 Edge— Internet resources. Supplies all of the up-to-date links a coder needs to find accurate modifier information online. Optum360 Edge — Decision tree flow charts. Coders learn how to choose the correct modifier when more than one could apply. Optum360 Edge — Real-life clinical examples. Reduce claim denials by learning from correctly used modifiers and completed CMS-1500 forms. 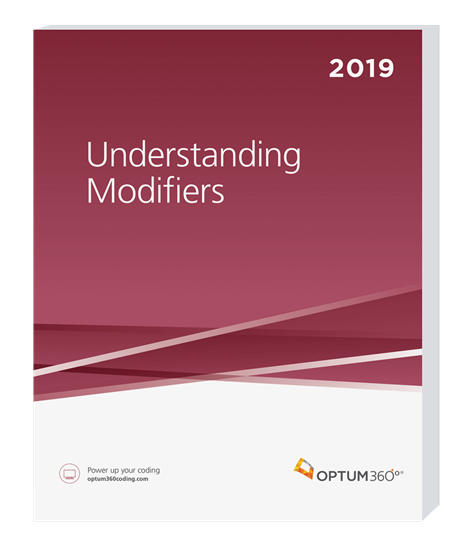 Includes 2019 changes to modifiers and their guidelines.